Offers real-time auto tuning of control parameters, based on measured test force and strain data. Safely make comparisons to unknown sample data without the need for preliminary tests. 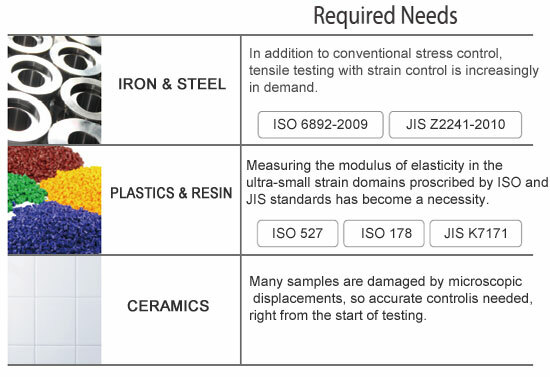 In addition, the AUTOTUNING FUNCTION easily performs strain control, an ISO6892-2009 requirement. The wide, guaranteed load cell precision range of 1/500 to 1/1 improves testing efficiency and ensures that virtually all of your testing can be performed without switching the load cell or jig. 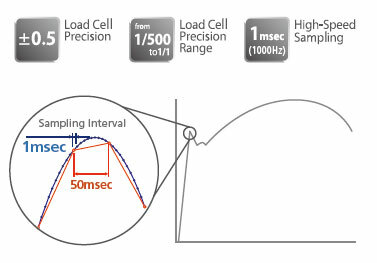 Furthermore, high-speed sampling of 1msec ensures no missed strength changes.